Our moral obligation to the Iraqis we leave behind. The headlines of the last few months make it clear that there are going to be no free passes for America when it comes to getting its troops out of Iraq. The recent bombing of a Shiite mosque in Baghdad, like the internal warfare in Sunni-dominated Anbar Provice, shows how many Iraqi security problems persist. But as President Obama continues the withdrawal of American troops from Iraq, he should do more than pay attention to conditions on the ground. He should also keep in mind how badly withdrawals from occupied countries have gone in the past, and take to heart the historical lessons these failed withdrawals teach. Though many experts have attempted military, strategic, and political analyses of how and when the United States should withdraw, there has been little attention paid to moral considerations in answering that question. In the same way that we think of just and unjust wars, we need to think of just and unjust withdrawals. Ethical understanding and historical reflection have too often been the exception rather than the rule when great powers withdraw from the countries they occupied. Nations carefully plan for wars. They mobilize support for them. But typically they rush into withdrawals, which they commonly see as signs of failure. Think, for example, of Great Britain's hasty retreat from India in 1947 and the estimated one million people who died following partition. Occupying powers typically behave as the British did, putting the safety of their own troops and civil servants, and the reputations of their political leaders, before any other considerations. There is good reason to challenge this historical pattern, especially when we think of the stakes in the Middle East today. We need to acknowledge that when one country occupies another, it acquires obligations--and this is true whether the initial occupation was a good idea or a bad one. In either case, social life has been disrupted. Even the displacement of a brutal and repressive regime brings death and destruction in its wake, uproots many people, damages the economy, shuts down schools and hospitals, subjects the local population to foreign rule, if only for a time. When foreigners depart, they must make sure that their departure doesn't produce further disastrous disruptions. First, make a good-faith effort to leave a stable government behind. Occupiers commonly claim that they are acting for the benefit of the country they are occupying. But even if they can't make good on that claim, they must try to leave the country no worse off than it was before they came. They don't have to, and often can't, establish a liberal or social democracy, but they should aim for a government that is legitimate in the eyes of its own people and that is capable of providing basic services--including law and order. And for the sake of that, they should be willing to offer ongoing financial and technical aid after they leave, even if the country they are leaving is not likely to be a reliable ally in the future. Second, do whatever is possible to safeguard the people most at risk in the country now on its own. Years ago, the philosopher John Rawls argued that distributive justice requires paying close attention to the least well-off people in your society. By analogy, justice in withdrawing requires paying close attention to the safety of the most vulnerable people who remain behind. This clearly wasn't the policy of the French in Algeria or of our own country in Vietnam. Careless exits leave many people at risk, who are killed, like the Algerian Harkis, or forced to flee, like the Vietnamese “boat people.” Departing powers must help such people restart their lives in safety, enabling them to re-establish themselves at home or providing neighboring countries with subsidies to shelter them. If people are at risk because they worked for (“collaborated” with) an occupier, as in the case of translators, drivers, guards, informers, and many others in Iraq, it is especially necessary is to offer them and their families asylum. Great Britain's behavior after the American Revolution provides a classic example of an imperial power doing the right thing. Over several months and hundreds of sailings through early December 1783, Britain removed thousands of Loyalists and sympathizers from its former colonies, sending 29,244 evacuees from New York to Nova Scotia alone. The Obama administration cannot undo the mistakes that the Bush administration made or the crimes that it committed in Iraq. But it can do the next best thing. It can mitigate their consequences for the Iraqi people and provide a model for how a modern occupation should end. To be sure, executing a just withdrawal, with appropriate concern for the Iraqis left behind, may require a significant allocation of time and resources, not to mention the lives of many additional U.S. soldiers. 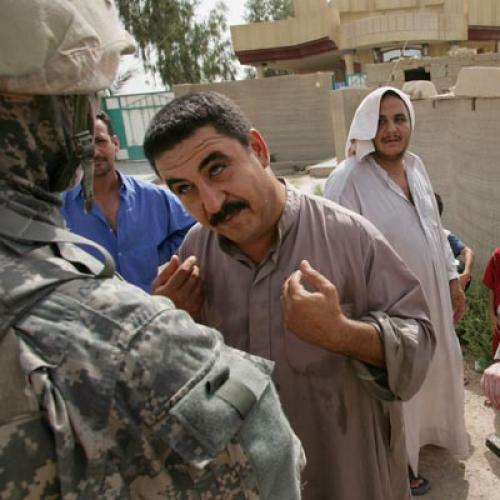 America's moral obligation to Iraq need not be only consideration in making these decisions. But its withdrawal from the country should not be as thoughtless as its entry. Michael Walzer, professor emeritus of social science at the Institute for Advanced Study, Princeton University, and Nicolaus Mills, professor of American studies at Sarah Lawrence College, are co-editors of the forthcoming book, Getting Out: Historical Perspectives on Leaving Iraq.